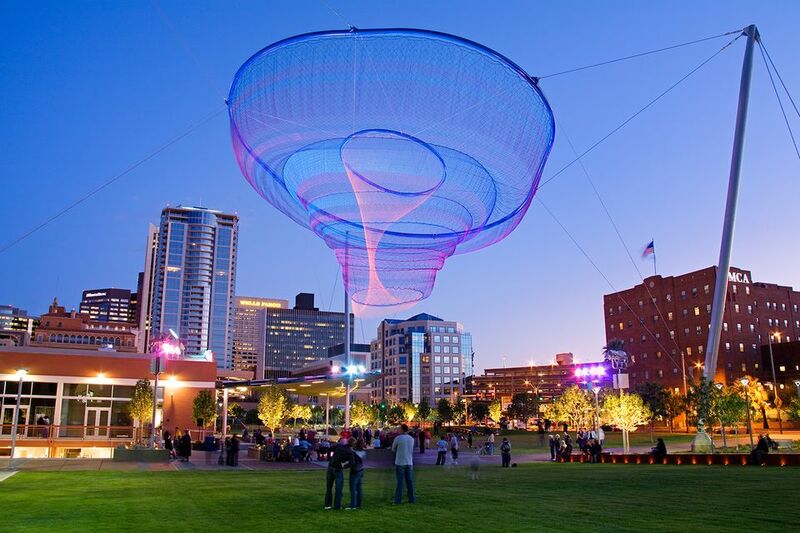 When it comes to outdoor events, festivals, concerts, and celebrations, October is one of the busiest months of the year in the greater Phoenix area. Whether you need to find a pumpkin to carve or a haunted house to explore to put you in the Halloween spirit, there are plenty of activities to enjoy on your trip to Phoenix this fall. Live music, entertainment, and prize giveaways take place on the second Friday of every month on Main Street in Downtown Mesa. This outdoor street party features a different theme every month and in 2018, the October theme is "Nightmare on Main." You can expect more than 40 artist and vendor booths alongside creepy costumes and decorations to transform this tranquil town center into a spooky market and street fair. Visit the 2nd Friday Night Out website for more information on performances, vendors, and this year's themes. Head over to Downtown Tempe for a family-friendly, free outdoor market every Sunday in October. Featuring dozens of vendors of arts and crafts, live music, and local cuisine for sale, 6th Street Market offers a great way to spend a casual Sunday morning near Phoenix. The first 6th Street Market this year will take place on October 14, 2018, from 10 a.m. to 3 p.m. (and every Sunday thereafter until April 14, 2019). New in 2018, you can also sample food from more than 30 Arizona food producers thanks to a partnership with Food in Root. Visit the 6th Street Market website for a list of vendors each weekend. If you're looking to give back to the local community on your trip to the Phoenix area, you can take part in the annual 15-k, 10-k, 9-k, or 5-k runs at Tempe Town Lake on Sunday, October 7, 2018. The annual "A Race for Maggie's Place" event is a fundraiser for a shelter for pregnant women and those with infants. Also featured in this year's event are a Kids' Dash and a Diaper Dash for toddlers as well as a 5-k walk and a Stroller Push for families and disabled participants. On Sunday, October 28, 2018, the annual AIDS Walk Arizona & 5K Run Phoenix returns to the downtown area to raise funds for 16 member agencies that provide programs to prevent HIV/AIDS or assist those living with the disease. Local bands will perform for the event, which also includes a kids' and dogs' walk so that the whole family can help raise money for this charitable cause. The walk starts at Third Avenue and Washington Avenue in downtown Phoenix and typically takes place the fourth Sunday in October each year. The Arizona State University (A.S.U.) School of Music presents concerts at a variety of venues across the Valley of the Sun each year, including at the Scottsdale Center for the Performing Arts on select Monday evenings. The A.S.U. Concert at the Center in 2018 will take place on October 22. You can also catch the A.S.U. Chamber Orchestra's presentation of "Frankenstein!" at the Mesa Arts Center on October 21, the A.S.U. Concert Jazz Band at the Tempe Center for the Arts on October 20, and the A.S.U Wind Orchestra and Chamber Singers and Concert Choir's presentation of "Sacred and Profane" at the Tempe Center for the Arts on October 16. For a full list of performances in October, visit the A.S.U. School of Music events' calendar. Arizona Cardinals Football: This professional football team plays games at the University of Phoenix Stadium in Glendale, Arizona. Phoenix Suns Basketball: The professional National Basketball Association (NBA) team for Arizona shoots hoops at the Talking Stick Resort Arena in Downtown Phoenix. Phoenix Rising FC: The official Arizona team for the Universal Soccer League (USL) plays on various dates in October. Art in the Olive Grove: Artists representing all types of art media display their work at the Queen Creek Olive Mill in Queen Creek on October 7, 2018. Downtown Chandler Art Walk: Visit more than 40 artisans set up along the streets in front of the unique shops and cafes of Downtown Chandler during this free event on the third Friday of October. Downtown Mesa Festival of the Arts: MACFest (Mesa Arts and Crafts Festival) is a free, family-friendly event featuring artist creations, music, and entertainment in Downtown Mesa on North Macdonald, from Main Street to Pepper Place on the first and third Saturday of October. First Saturdays for Families: Families with kids ages 4 to 12 are invited to the ASU Art Museum in Tempe to participate in artistic projects on the first Saturday of the month. Gilbert Off the Street Art Festival: Live music, street performers, kids' activities, food, and artisan and craft vendors return to downtown Gilbert on October 26 and 27, 2018, for this free event. Stagecoach Village Art & Wine Festival: Explore fine art, fine wines, and local cuisine at Stagecoach Village in Cave Creek at this free event from October 26 to 28, 2018. Scottsdale ArtWalk: Every Thursday evening the Scottsdale Art District invites you to spend a casual evening walking downtown and enjoying fine art at the city's many galleries—all for free! From October 5 to October 28, 2018, the Arizona State Fair returns to downtown Phoenix (1826 West McDowell Road) for a month-long celebration of everything the state has to offer. Held at the Fairgrounds in Central Phoenix, the Arizona State Fair features rides, local cuisine (and fried fair food), competitions, concerts, and exhibits every day of the week except Mondays and Tuesdays. Concerts in 2018 at the Veterans Memorial Coliseum require reserved tickets and include performances by Gary Allan, The Flaming Lips, The Wallflowers, Pitbull, Anthrax, Paulina Rubio, Big & Rich, Casting Crowns, and Sesame Street Live. Competitors will cook tacos and related dishes for a competition to name the best taco in Arizona at the annual Arizona Taco Festival in Scottsdale. You'll need to buy a general admission ticket to attend, which grants you access to about 50 restaurants serving up $2 tacos as well as margarita and beer bars; purchases on-site are made using pre-purchased tokens. There will also be a Chihuahua Beauty Pageant, as well as live music performances by local artists. This two-day celebration of love and tacos will return to Salt River Fields on October 13 and 14, 2018. On October 6 and 7, 2018, hundreds of exhibits of products and services including fashion, beauty, health, fitness, home, careers, financial planning, and education will set up shop at the Phoenix Convention Center for the annual ​Arizona Ultimate Women's Expo. The event will feature a full schedule of speakers on four stages, book signings, celebrity appearances, and cooking and design demonstrations, including design experts providing tips on preparing your home for the holidays. On October 20 and 21, 2018, Autumnfest returns to the Community Park in Anthem (41703 North Gavilan Peak Parkway) for two full days of fall fun. Autumnfest features a carnival, live entertainment (including music performances by local bands), fine arts and crafts sales, a pumpkin patch, train and hay rides, inflatables, and a food court featuring a beer and wine garden. The event, presented by the Anthem Community Council, is free to attend but food and drinks must be purchased on-site. Birds 'n' Beer offers local professionals a fun and refreshing way to learn about Arizona birds and other wildlife while networking with fellow nature-lovers. On the third Thursday of October, you can have a cold brew while enjoying an enlightening and lively presentation on Arizona nature at the Nina Mason Pulliam Rio Salado Audubon Center in Phoenix. Reservations are not required but strongly encouraged in case space fills up on the tour. On Friday, October 12, 2018, from 6 to 9 p.m., you can watch "Coco" at the City Lights Movie Night event at CityScape in Downtown Phoenix. This free monthly event features giveaways, contests, and prizes, but guests are encouraged to bring their own chairs as no seating is provided by CityScape. In a special partnership with St. Mary's Basilica and its Dia de Los Muertos Festival, this year will also feature a parade through CityScape. The movie starts at 7 p.m., and festivities start at 6 p.m. in Patriots Park. Every Tuesday in October, you can join fitness experts from the Valley of the Sun in guided workout sessions during Fitness in the District at the WaterDance Plaza of the Westgate Entertainment District in Glendale, Arizona. Certified instructors will lead sessions to DJ beats, while fitness motivators work within the group to assist attendees with moves. This event is free, but you should bring your own workout or yoga mat. Refreshments will be available while supplies last. Enjoy shopping, crafts, hands-on activities, and live music at the Catlin Court and Old Towne in historic downtown Glendale for the annual Front Porch Festival & Old Towne Marketplace on Saturday, October 13, 2018. This special Glendale celebration also features local shops and restaurants presenting various demonstrations and workshops featuring "make and take" crafts and delicious treats. This event is free to attend and will take place from 10 a.m. to 4 p.m. Although Phoenix doesn't have the largest population of German immigrants in the United States, it still celebrates the tradition of Oktoberfest. There are several places around town where you can get that Oktoberfest spirit by dressing up in your Bavarian best, eating bratwurst, and dancing to the polka all day long if you'd like. Oktoberfest celebrations in Phoenix include several bar crawls as well as a few dance parties at German pubs and restaurants around the Valley. From kid-friendly pumpkin patches to terrifying haunted houses and festivals, there are plenty of ways to celebrate Halloween all month long in the Valley of the Sun. ​If you plan to spend Halloween in Phoenix, take a trip to Howl-o-Ween at the Phoenix Zoo where kids can trick-or-treat while dressed up like the zoo animals, or head over to Salt River Fields Balloon Spooktacular on October 27 and 28, 2018. Other haunted events include ghost tours at Hermosa Inn, PoeFest at the Rosson House Museum, and the Cave Creek Wicked pub crawl. October is Hispanic Heritage Month, and the large Latino population in Phoenix celebrates each year with a series of events and festivals throughout the Valley of the Sun. You can catch performances of dance, music, and theater as well as see art displays and listen to literary lectures and readings all month long, but some events take place in September. On Saturday and Sunday, October 20 and 21, 2018, the annual celebration of the LGBTQ community of Phoenix returns to Heritage Square from 10 a.m. to 6 p.m. each day. Rainbows Festival is a free urban street fair and festival in downtown Phoenix featuring music, art, shopping, food, and entertainment. Over 150 exhibitors and sponsors will be on display during this two-day event; food will be available on-site; there will also be two stages of live entertainment each day. On Saturday, October 27, 2018, at Encanto Park in Phoenix (2605 North 15th Avenue), the annual fundraising event benefiting the Waste Not Arizona charity known as Empty Bowls returns to the Arizona Center. During the event, guests select a unique, handcrafted ceramic bowl from thousands of donated bowls for a donation and are served a modest portion of soup. The contents of the bowl won't fill you up, but it is similar to the total amount of food consumed on a daily basis by many less-fortunate people around the world. After the event, you can keep the commemorative bowl as a reminder that someone else’s bowl is always empty.